Note: If the angle α is negative, i.e. 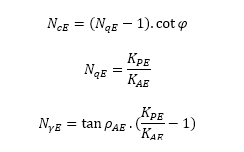 φ < θ, then the seismic bearing capacity is pLE = 0. Das, B. M. Principles of Soil Dynamics, 3rd ed. ; California State University: Sacramento, 2016.